Some children wanted to paint and they weren’t shy in telling us ! Kieran said ‘paint’ , while Luke was pointing at the art shelf. Elena laid out the table with everything they needed – big pieces of paper, different containers with lots of paint in various colours. She also put some brushes, sponges and tape out. The children got stuck in and many showed an interest in the tape in particular so we helped them to break pieces off and stick it onto coloured paper. Others focused on their painting using the brushes and sponges. The next time we go painting we might add some flour to the table to see what the children will do! Some parents commented that their children loved to paint and really enjoy it. While out on a hike the children noticed the tyres were full of water from all the recent rain. They decided to collect the water to make soup. Among them selves they decided to play restaurants and appointed different children to the various jobs in the restaurant. They worked really well together and brought the restaurant to life. They listened to each other’s ideas and put them all into practice. Giving the children the opportunity to lead to come up with activities is a great way to bring out their individual personalities. Leon’s Mum said he loves to watch cookery programmes. This week we started our preparations for our first ever Christmas Fair. We laid out some black bags on the floor and placed large brown boxes and tubs of red paint on them. Brushes and sponges were provided. Tadhg, Killian and Oisin were the first to get stuck in. As they painted the boxes in red paint more children got involved. 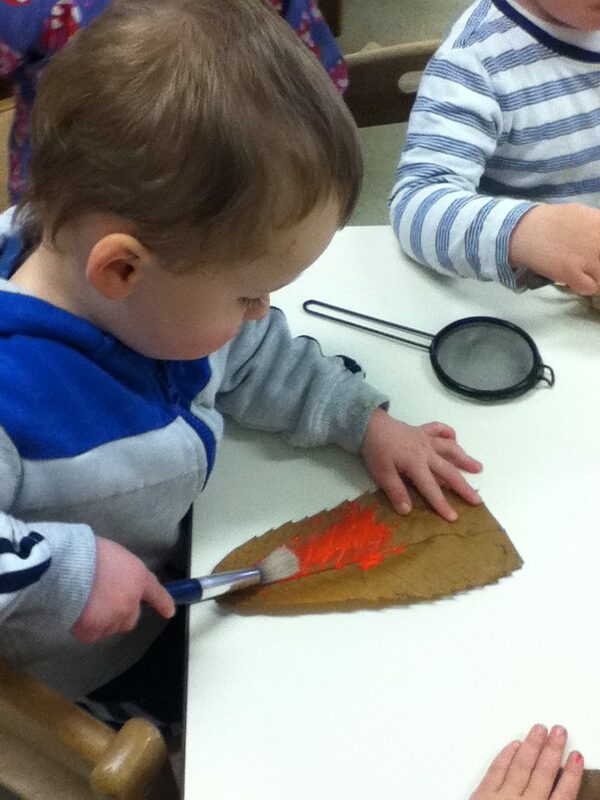 Some opted for sponges while others choose paint brushes. A few children decided to use their hands. Once all the boxes were painted red glitter was sprinkled on top. It was a successful activity and next up will be the colour green as we paint more boxes for our Christmas Fair. It is a great way for the children to work together and improve their vocabulary and colour recognition. Some of the Mum’s commented that their children loved to mess and others said a good dip would be required that night to get rids of the red paint!